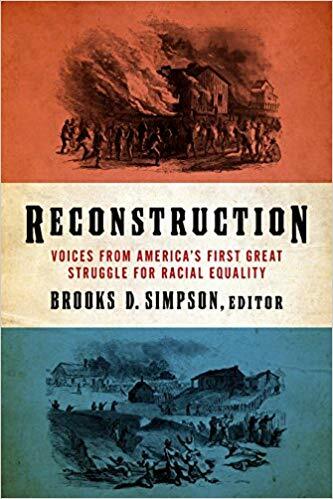 In Reconstruction: voices from America’s first great struggle for racial equality , Brooks Simpson has organized the diversity of voices calling out for racial equality during the 12 years after the Civil War ended, known as Reconstruction. The voices are collected from a variety of primary sources including diaries, newspaper articles, letters, interviews, and more. The works are presented chronologically and show that with the end of the Civil War, America’s struggle over racial equality was really only just beginning. We have works that show the controversy over the passing of the 14th and 15th amendment, and one’s that reveal the tension that lead to the first impeachment of a president in Andrew Johnson. Reconstruction highlights a complex and aspirational time in America’s history that ultimately ended tragically. For more by Brooks Simpson, check out his edited work The Civil War: the third year told by those who lived it. Reference and Instruction Librarian at University of Wisconsin-Whitewater's Andersen Library. Liaison to History, Women's/Gender Studies, Sociology, Criminology, and Anthropology, Theatre and Dance, Philosophy and Religious Studies departments.